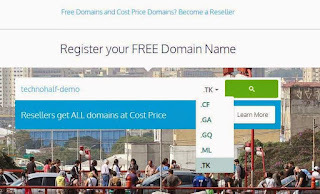 Are you experience frustration at some point in default long domain name in Blogger like yourdomain.blogspot.com and want to change free custom .tk domain, you are at right place to set-up custom .tk domain in blogger.com,. Before we proceed, Lets get to know what exactly is Domain Name? The first-level set of domain names are the top-level domains (TLDs), including the generic top-level domains (gTLDs), such as the prominent domains com, info, net, edu, and org, and the country code top-level domains (ccTLDs). Below these top-level domains in the DNS hierarchy are the second-level and third-level domain names that are typically open for reservation by end-users who wish to connect local area networks to the Internet, create other publicly accessible Internet resources or run web sites. Step-2: Enter your desire domain and select .tk from the option, click on “Search” button, same below screenshot. 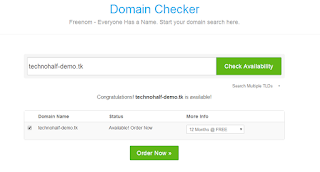 Step-3: If your desired domain is available then you redirect on Domain Registration page set registration length as 12 months and like this screenshot below. If not, then try any other domain name. 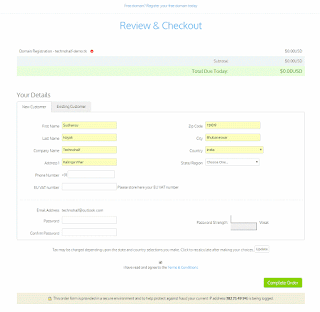 Step-4: Clicked Order Now button. Here you have to verify your account by email, Verification link Sent to Your Email The Link, go to your Email Index and Click On The Link it redirect to checkout Page. Step-1: Go to Blogger Settings and find Publishing option in your dashboard. 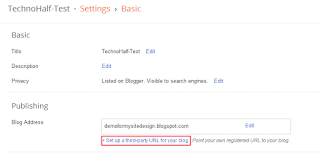 Now click on Set up a third-party URL for your blog. Step-3: Hit Save button, you get a Error i.e. We have not been able to verify your authority to this domain. Error 12. Now That's what we require, two CNAME like below picture. Don't close this Page. 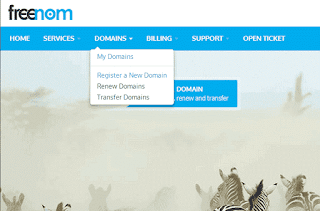 Step-4: Open a New Tab in Browser and Go to Your Freenom ClientArea Link and click on Domain Panel and then click on “My Domain” same below screenshot. Step-7: First of all Select “CNAME Record” from type option then write “www” in Name and “ghs.google.com” in Target and Leave TTL to 14440 . Step-8: Again to add another CNAME click on “More Records” and then write Host Name and Target that you got in error . You can do it same below image.